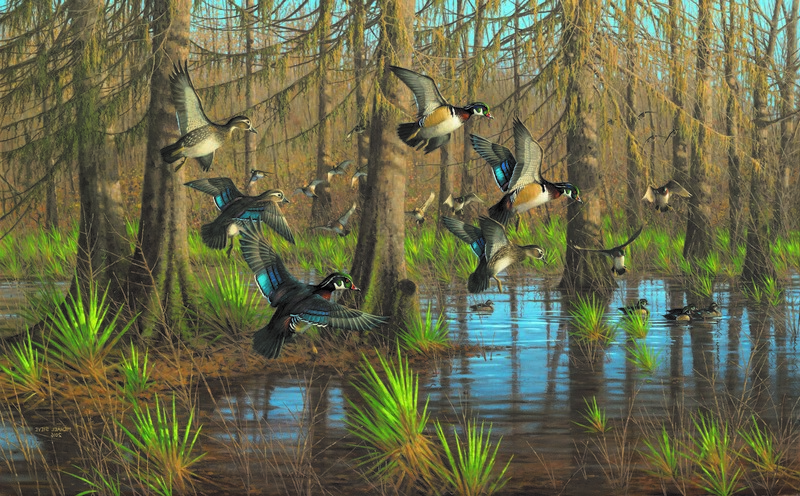 What an exciting weekend at the 2017 Federal Duck Stamp contest! 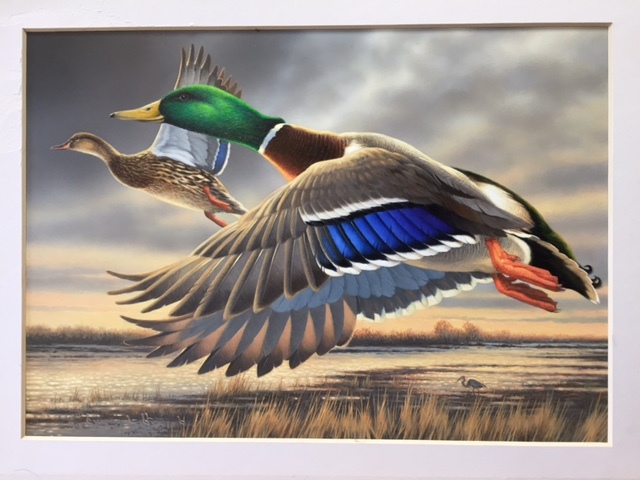 Mike entered this piece depicting two mallards in flight. 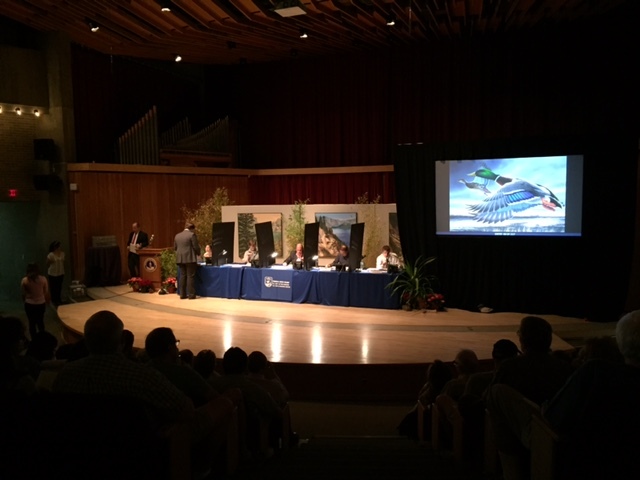 There were 217 entries in the first round, in which each of the five judges simply indicated In or Out. Mike’s entry was Number 48, and his was the first to receive five In votes. We knew then that the judges liked his piece, but he still had a long way to go. The second round of judging took place the next day, and in this round each judge assigned a score from 1 to 5 to each entry, with 1 being the lowest score and 5 being the highest. Mike’s piece was the first to receive a score of over 20—four judges gave him a 5 and one judge gave him a 3. His score of 23 remained the highest score through the first half of the second round, but there were a lot of good entries yet to be judged. By the end of the second round, only twelve entries remained, two with a score of 23 and two with a score of 24. We were feeling very hopeful, but contests can be tricky, and we knew that things could change quickly in the final round. Unfortunately, we were right. Mike’s piece was the first to be judged in Round 3, and his score went from 23 down to 20. At that point, we knew that there wasn’t much chance of his entry being in the top three. In the end, he received the fifth highest score, but with several ties in both fourth and fifth places. We are saying that he finished in the top ten. 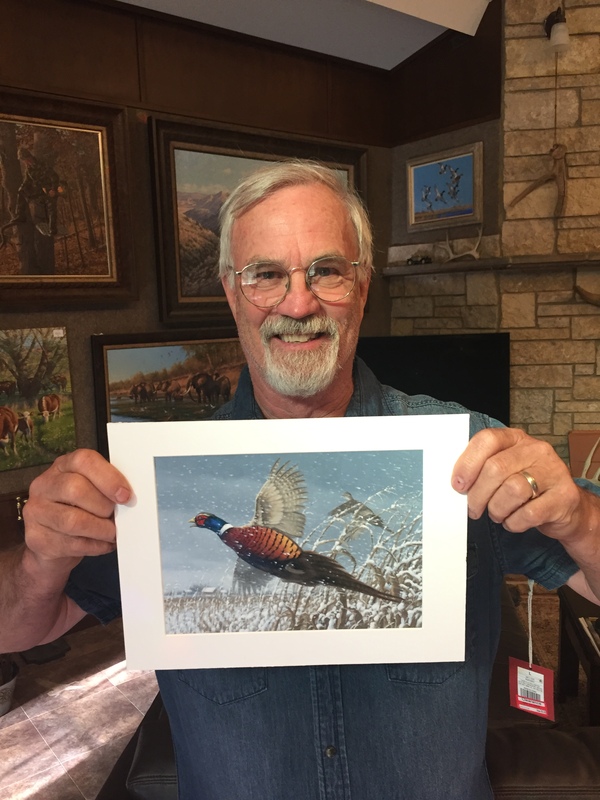 In first place was Bob Hautman with his third Federal Duck Stamp win. He and his brothers Joe and Jim have thirteen wins among the three of them, so they are tough competition. Luckily, the winner must sit out for three years, so that will help level the playing field for next year. We were thrilled to see Mike’s good friend Greg Alexander take second place. Third place went to 23-year-old Christine Clayton, and it was wonderful to see a young woman do so well in the contest. We truly enjoyed the entire weekend, and Mike is already working on his design for next year! Join us for a Christmas Open House! Please click for information about our Christmas Open House. If you have not visited our gallery, go to the Contact Us tab for directions. This year Mike entered his painting “The Elephant in the Room” into the Leigh Yawkey Woodson Birds in Art exhibition. Not only was his painting chosen to be included in this wonderful exhibition, but it was also chosen as one of only three entries to be used as a show poster. Mike was asked to create an audio description of the painting and to provide slides showing his research, and then Woodson Art Museum used his slides and audio to create a video that goes with the painting. Click Show Poster to view the poster, and click the Play button to view the video. Please check out the new Videos tab to see start-to-finish videos of Mike’s latest painting!